In their two decades of existence, the Da Capo Chamber Players have established themselves firmly as one of America's finest contemporary music ensembles. 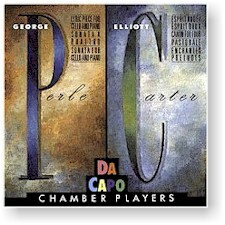 Along the way they have garnered the respect and admiration of a generation of composers, including two of the most highly esteemed of all American masters: George Perle and Elliott Carter. Recorded (#9-12) May 1987 in the Recital Room at Shepard Hall at the City College of New York; (#2, 13) 5 Feburary 1988 at Merkin Concert Hall in New York; (#1, 3-8) 15-16 September 1988 at SUNY-Purchase.